I’ve been putting off this post for a few weeks because I am desperately trying to remember the salient details of a story about lentil and sausage soup. It was at least 20 years ago. I can remember being doubled over laughing in the soup aisle of a grocery store, shrieking and crying over the hilarity of Progresso’s Lentil and Sausage Soup. If you just stopped to reread that sentence in order to pick up whatever word you missed that would clue you in to what might possibly be so uproariously funny about lentil and sausage soup, do not panic. That’s the detail I can’t remember. I’ve been kicking that story stub around my poor little brain for several days to no avail, and I just can’t hold out on the recipe any longer. It doesn’t help that I’ve had a song stuck in my head for days. A horrible song. It is nearly impossible to remember funny stories from your childhood when the one-hit-wonder LEN is screaming WOULD YOU STEAL MY SUNSHINE?!! during every quiet moment, to say nothing of the difficulties it presents at work. I’m not going to say that those words made it into a motion last week, just that having professional proofreaders on staff is a really beautiful thing. The upshot of the story is this: we tried the soup, it was amazing, I fell in love with the combination of lentils and sausage, and Progresso can enjoy an everlasting bout of shingles for discontinuing it. Since the soup is no longer available, we have to make do on our own. But freed from the confines of the can, lentils and sausage show themselves to be equally charming without the accompaniment of broth, their trusty backup dancer. 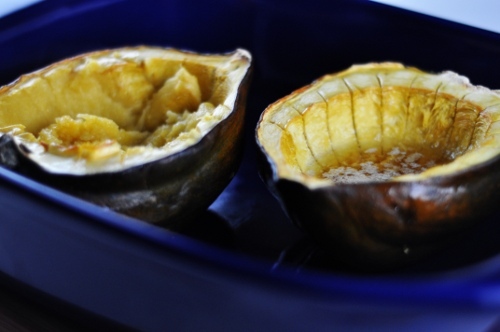 We had so much fun with butternut squash earlier this month that I thought I’d feature acorn squash, another one of my favorites. Petite and perfect, they bake handsomely when paired with a little butter and maple syrup. I find combining them with lentils and sausage to be particularly satisfying. The lentils and squash are both earthy and smooth, but in slightly different ways; their textures complement each other while their flavors layer gently. Hot Italian sausage, when paired with the sweetness of the maple syrup, is vibrant but softly restrained. The result is a happy little barbershop quartet of flavors, portioned perfectly in its own ready-made bowl. You will notice that you end up with a lot of extra lentils. It’s sort of intentional. In order to avoid leaving you high and dry without sufficient lentil coverage for any particularly robust acorn squash you may encounter, I’ve asked you to make more than you need. Still, since it’s frustrating to end up with an extra third of a serving of something, I’ve given you a basic proportion for about three cups of cooked lentils. This way, you have plenty to eat as leftovers by themselves, in a salad, in soup, whathaveyou. If having extra lentils really puts a knot in your knickers, reduce as your heart desires. 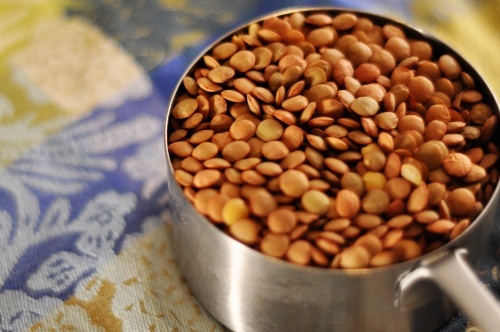 Measure a cup of dry lentils into a medium saucepan and cover with cold water – about three cups. Bring to a boil over high heat and allow to boil for two minutes uncovered. Reduce the heat to low and cover. Simmer gently for 30-45 minutes until the lentils are soft and most of the liquid is absorbed. Be careful not to boil during this phase, or the lentils will burst (if this happens, don’t weep; they will look a little gnarly but still taste like lentils). Once the lentils are simmering, turn to the squash. Use a large knife to slice it in half, length-wise, from stem to end. If you put a little thought into it before you make your cut, you can plan the cut so each half will balance flat between two ridges when you set it in a baking dish. If you miss this opportunity, of if this instruction makes no sense, don’t worry about it. Scoop out the seeds and stringy bits with a spoon and discard. Set the squash halves cut-side up in a shallow baking dish. Add a tablespoon each of butter and maple syrup to each cavity and bake, uncovered, for 45 minutes or until the flesh of the squash is very tender when pierced with a knife. When the lentils are ready, drain them and set aside. Squeeze the sausage from its casing and cut into small pieces – I usually use kitchen shears. Cook the sausage pieces in a non-stick skillet over medium-high heat until nicely browned and cooked all the way through. Add several large spoonfuls of lentils and reduce to medium-low heat, stirring gently to combine the lentils with the sausage’s juicy goodness. Remove from heat. 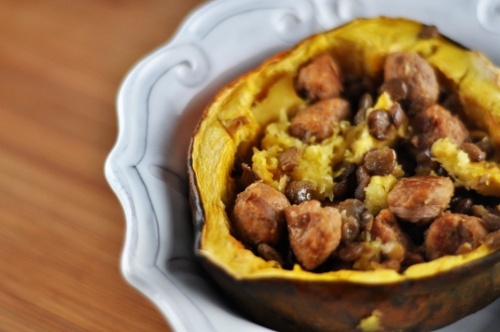 You should now have two squash halves that are tender and filled with sizzling, syrupy fun. You can heap the sausage and lentil mixture in as-is, but it’s a little nicer to score the squash first for easy mixing. Keep in mind that the butter and maple syrup are now quite hot, so use caution in scoring and mixing so you don’t, say, splash piping hot liquid all over your sweater and narrowly miss burning the crap out of your stomach. Not that I know anything about that. 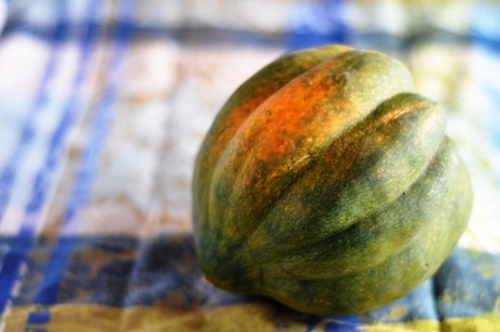 Hold a squash half with tongs or an oven mitt and carefully score the flesh of the squash with a paring knife. Next, take a spoon and scoop through the flesh of the squash a bit, scraping against the sides as you go, until you have started to mix the squash with the syrup. Add half the sausage and lentil mixture and serve immediately. I made this tonight. Fantastic! My husband said it’s his new favorite dish. Didn’t change a thing. Now off to make the almond butter cookies. Yay!